Tea caddys / tea boxes / tea containers / tea tins / Matcha boxes / Matcha containers / Matcha tins / Matcha tea tins / Matcha tea caddies / Matcha tea containers from different materials and in various styles for the proper, convenient and decorative storage of loose leaf teas. Classic Tea Container ‘Avalon’ – two sizes 25g and 100g; tin plate, black with golden slip-lid; vintage-style “Tea” imprint; classic British design; dimensions 25g box: H 65 x 40 x 40 mm; dimensions 100g box: H 98 x 65 x 65 mm. Classic Tea Container ‘Tea’ – filling capacity ca. 100g, depending on type of tea; tin plate, faint silver, angular shape; hinged flip-top lid with gold-colored lid button; gold-colored, embossed label ‘TEA’; dimensions: height 100 x 65 x65 mm; classic European-style design. Japanese Matcha Container ‘Natsume’: Matcha tea container (‘Natsume’), used in Japanese tea ceremony for storing Matcha supplies used in the ceremony; different colors and motifs. Japanese Tea and Matcha Box ‘Tamiko’, 2-pcs set -ca. 100g / box (depending on type of tea); case tin plate, round; air-tight and humidity-proof, plus additional aroma protection inside plastic cap; set 2 pieces tea and Matcha Box, 2 different characteristic Japanese motifs; dimensions: height 8cm, Ø 8 cm; in decorative gift box. Japanese Tea and Matcha Tin ‘Sayo’, 3-pcs set – filling capacity ca. 65 g / tin (depending on type of tea); case round, texture-coated tin plate; slip lid system; double airtight through additional aroma protection inside cap (well-tried sealing system of Japanese ‘Chazutsu’ tea tins); set 3 pieces Tea & Matcha Tin, 3 different colors: white, red and grey; dimensions: hight 10 cm, Ø 6,5 cm. Japanese Tea Box Set ‘Kyoto’, 2 pcs – filling capacity ca. 125 g / box (depending on typoe of tea); set 2 Tea Boxes with 2 different motifs; tight closing screw cap; suitable for loose leaf tea and Matcha tea powder; dimensions: height 110 mm, Ø 73 mm. Japanese Tea Caddy Set ‘Anakusa’, 2-pcs set – filling capacity ca. 100 g / caddy (depending on type of tea); case tin plate, round; set 2 pieces Japanese Tea Caddy, 2 different Japanese motifs; comes in a decorative gift box; tight sealing slip lid; dimensions: height 12,5 cm, Ø 6,5 cm. Tea Box ‘Gloria’ – capacity 100g; a tea box “classic”; tin plate, angular shape; plain, faint golden; push lid; dimensions: 88 x 73 x 73 mm. Tea Box ‘Isa’ – available in 2 sizes 225g / 320g; color: faint silver; case: plastic, with tea pot shaped viewing pane; stainless seel, aroma clamp seal; airtight locking properties; large box (320g) with portioning spoon; dimensions 225g box: 130 x 100 x 100 mm, dimensions 320g box: 170 x 100 x 100 mm. Tea Box ‘Till’ – available in 2 sizes 100g / 200g; tin plate, angular shape; plain, faint silver; slip lid; dimensions: 2oog box 125 x 88 x 88mm, 100g box 107 x 70 x 70 mm; a ‘modern classic’. Tea Caddy ‘Globe’ – two optional sizes 20g and 100g; Tin plate, round; color: faint silver; tightly closing slip lid; dimensions 20g container: H 70 mm x Ø 53 mm; dimensions 100g container: H 115 mm x Ø 90 mm. Tea Caddy ‘Glory Oval’ – filling capacity ca. 125g, depending on type of tea; tin plate, space-saving oval shape; color: faint silver; tightly closing slip lid with inside integrated aroma seal function; dimensions: height 115 x 105 x 55 mm; well suitable as a travel companion. Tea Caddy ‘Glory’ – filling capacity ca. 130g, depending on type of tea; tin plate, round; color: faint silver; tightly closing slip lid with inside integrated aroma seal function; dimensions: height 150 mm, Ø 65 mm; stylish and simple space-saver, well suitable for travel. Tea Caddy ‘Hasine’, 150g – filling capacity ca. 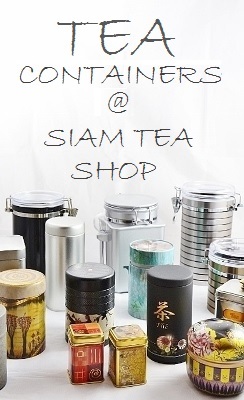 150g, depending on type of tea; case plastic, optional colors silver and bronze; airtight locking stainless steel aroma clamp seal; viewing pane lid, dimensions: height 12 cm, Ø 10 cm. Tea Caddy ‘Hasine’, 250g – filling capacity ca. 250g, depending on type of tea; case plastic, optional colors silver and bronze; airtight locking stainless steel aroma clamp seal; viewing pane lid, dimensions: height 18 cm, Ø 10 cm. Tea Caddy ‘Loreen’ – capacity ca. 150g, depending on type of tea; tin plate, round; color: faint black; tightly closing screw cap; dimensions: height 55 mm, Ø 76 mm. Tea Caddy Set ‘African Life’ 2 pcs -filling capacity 125g / caddy, depending on type of tea; set 2 caddies with different African motifs (giraffe, elephant); case tin plate, round; tightly locking screw cap; gloss-varnished and embossed; dinensions: height 110 mm, Ø 73 mm. Tea Container ‘Boss’ – fillingcapacity ca. 250g (depending on type of tea); case tin plate, round; color faint black; transparent plastic viewing pane lid ; locks airtight, with aroma clamp seal; dimensions: height 165 mm, Ø 103 mm. Tea Container ‘Cult’ -filling capacity ca. 80g/container, depending on type of tea; case tin plate, black and gold color; transparent viewing pane lid; The golden color „Cha Cult“ imprint and the stainless steel aroma clamp seal of the same color give the item a particularly noble appearance; airtight seal; dimensions: height 85 mm, Ø 90 mm. Tea Container ‘Nevio’ – filling capcity ca. 200g (depening on type of tea; tea container with extraordinary design in the style of a classic milk can; available in the colors green and blue; stainless steel, round; with label holder; dimensions: height 120mm, Ø 105 mm.